Cadbury has partnered with leading taste psychologist Greg Tucker to uncover the regional differences when it comes to our favourite flavours. In a nation-wide study into what tickles the nation’s taste buds, it’s been revealed that where we live can have a big impact on what we like and how adventurous we are with new flavours. 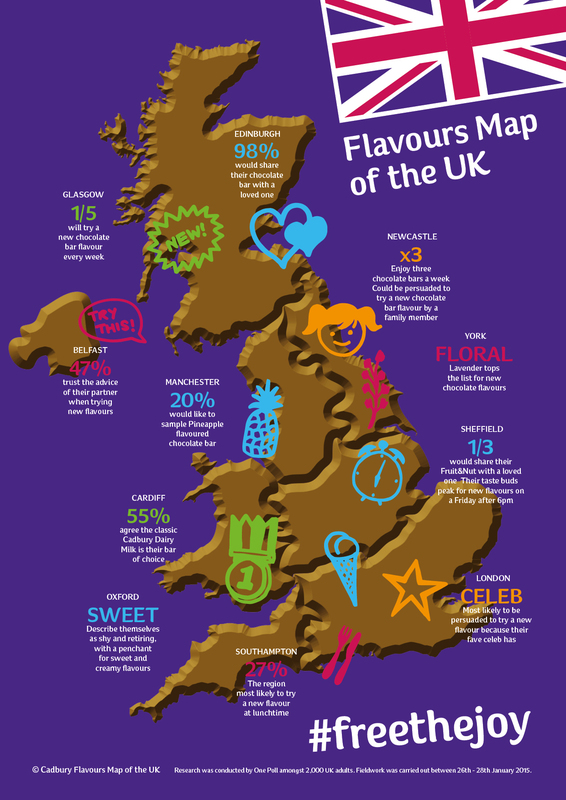 The study found that Cadbury Dairy Milk (CDM) Caramel takes the crown in the North for igniting feelings of warmth (38%), the Welsh go nutty for CDM Whole Nut because of its solid and traditional roots (28%), and those residing in the capital are most likely to pick a CDM Fruit&Nut (48%) with its variety and intrigue. • Cadbury Dairy Milk: In Cadbury chocolate we have the desired blend for the consumer of both sweetness and also dairy. The sweetness delights and the dairy comforts and relaxes. • CDM Caramel: The Caramel bar has a sweetness that is perceived to be more intense and impactful by consumers – simply because it has a longer dwell and reach in the mouth – the melt is sustained, the flavour lasts. • CDM Whole Nut: A somewhat challenging, difficult and conflicted eat – requiring as it does the hard chomp of the nut within the matrix of the chocolate. Preferred in older communities, where the nut adds real contrast to the chocolate to make it seem more valued and engaging. • CDM Fruit&Nut: Here is a product where there is chew and chomp, melt and fracture – a real textural melange. It adds variety and interest to the palette but always within the reassuringly known and loved envelope of the Cadbury chocolate. • CDM Turkish: This bar has a full sweetness – with the hints of the classic flavour of rose water to give it a brightness and vibrancy, yet it also has a somewhat charming and exotic melt. • CDM Oreo: The Oreo bar provides the textural variety that is quite appealing, a taste that to many is more recent – and a hint of dairy richness and engagement yet which is also quite light and uplifting. • CDM Daim: The buttery rich crunch of the Daim bar allows the chompy style eat to be maximised – with a rush of rich flavours that rewards the effort. In a bid to get the nation to take a break from the ordinary, and celebrate its full range of Cadbury Dairy Milk flavours, the study also explored the best time for consumers to experiment with new tastes. With the constraints of the working week removed and the carefree nature of Saturday evening in sight, our risk-taking outlook is heightened at the weekend. In fact, Saturday afternoon at 4.29pm has been identified as the exact time we are most likely to try something new. Being in a relationship also makes us more adventurous with food, as the majority of Brits are persuaded to try new flavours by their other half (36%). This is closely followed by family members (25%) and friends (24%), proving it’s the recommendations of those that know us well that really count. There is no denying that taking the leap and adopting new flavours has its rewards. Those who have a lot of variety in their diet/tastes consider themselves smart (37%), caring (56%), friendly (58%), adventurous (16%) and happy (33%). “Trying new flavours is a way to give ourselves a heightened understanding of what we like and why we like it – so we can find products that suit our mood better. Confectionery is a safe environment to try new flavour, and with CDM being the nation’s favourite chocolate it is a great way to start experimenting,” Tucker continues. I’ve not tried the Dairy Milk Oreo, but I have it on my to-try-soon list. It’s been a long time since I had a Daim bar, not tried the Cadbury’s one yet, should seek it out. ooh the turkish delight is my guilty pleasure. very sweet so just an occasional treat, but I love the rose flavour.